Special 6-4 is the fourth level of Special 6 in Super Mario 3D Land. 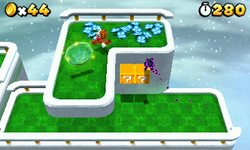 It is based off of World 4-3, but this time a Cosmic Clone chases the player. The player starts off on a small grassy platform in front of some rotating blocks that lead to a small platform, with some ? Blocks that contain Coins on it, after this are more rotating blocks that lead to a platform with a Rubber Platform on it. After this is a another rotating block segment that leads to the Goal Pole. Star Medal 1: On the first grassy platform after the rotating blocks. Star Medal 2: Near the bottom of a red rotating block, before a grassy platform with a Rubber Platform. Star Medal 3: On the blue rotating platform at the beginning of the large rotating block segment.